Today I will focus on the higher power series, the N8900. Next week, I’ll post about the N6900/N7900 series. What is particularly exciting for us about the N8900 series of products is that it is the highest power level we have ever provided. 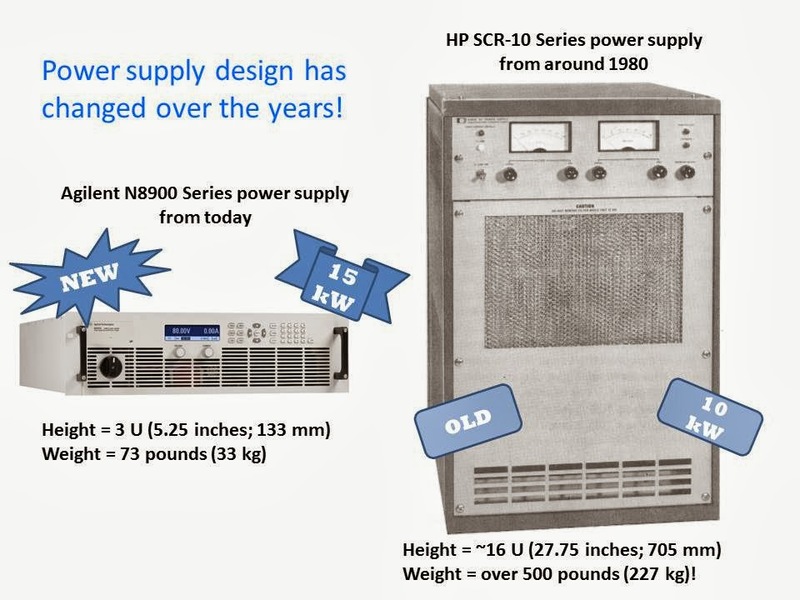 I’ve been working here at Agilent with power products since 1980 (we were Hewlett-Packard back then and will soon get yet another new name), and until now, the highest-power power supply we offered was the HP SCR-10 Series at 10 kW. This product was discontinued many years ago. Now the new N8900 series has 5, 10, and 15 kW in a single model and outputs can be paralleled for 100 kW or more! Now that’s a lot of power!! Back when I started, 10 kW came in a much larger package and weighed over 500 lb (227 kg)! Today, we can get 50% more power (15 kW total) in an 80% smaller package (3 U vs 16 U) that is 85% lighter (73 lb vs 500 lb). See the figure below. The new N8900 series offers 14 different voltage, current, and power combinations with output voltages up to 1500 V and output currents up to 510 A. Outputs can be put in parallel for 100 kW or more. 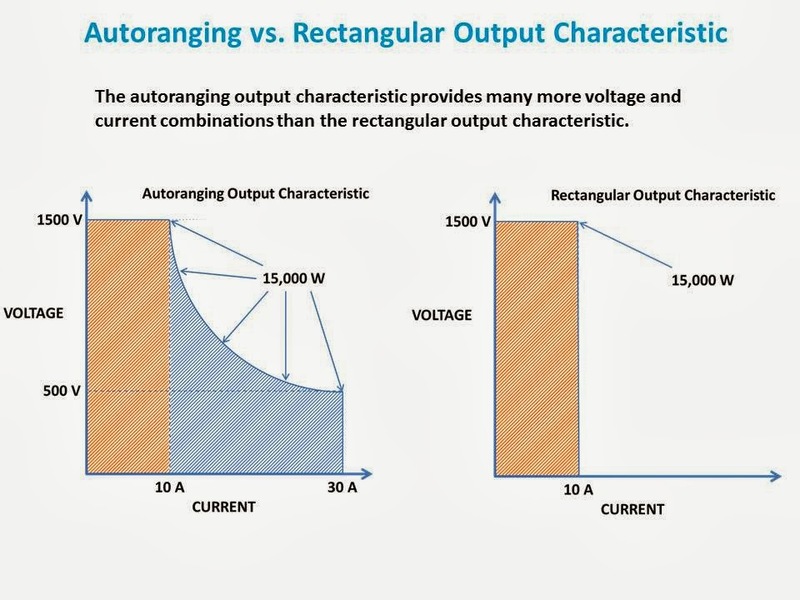 These are basic power supplies, but have autoranging output characteristics so you get more voltage and current combinations from a single output than if you used a power supply with a rectangular output characteristic. See the figure below. We also created a video introducing the N8900 series (I do a cameo toward the end…can you pick me out?). These basic power supplies will be used in many different high-power applications, such as hybrid-electric vehicle test and photo-voltaic inverter test. So if you need a basic high-power power supply, check out the Agilent N8900 Series. And don’t hesitate to ask me a question about the product or its suitability for your application.